Picking up from where 6 Important Facts about Intersection Car Accidents (Pt. 1) left off, here, we will continue to delve into some important information drivers should know when it comes to these types of collisions. Fact 3: Drivers’ judgment errors commonly cause intersection car accidents. 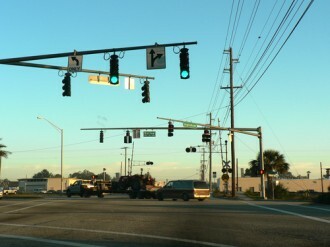 Driver errors, as well as the presence of red light cameras at intersections, commonly cause intersection car accidents. In some cases, drivers who may be trying to abide by the law and drive safely may simply misjudge other drivers’ actions or speeds and, consequently, cause intersection car accidents. In fact, the National Highway Traffic Safety Administration (NHTSA) reports that “false assumptions of other’s actions” accounts for about 8.4 percent of all intersection car accidents that occur each year. This equates to more than 63,500 intersection car accidents annually. Misjudging other drivers’ intended action (such as whether or not other drivers intend to turn at an intersection). NHTSA researchers have found that drivers who are younger than 24 and older than 65 tend to be the motorists who are most often be responsible for making the judgment errors that cause intersection car accidents. Fact 4: Red light cameras can increase the risk of intersection car accidents. Can cause some drivers to alter their driving behaviors, such as by slamming on the brakes at a yellow light instead of proceeding through the light as others may expect. In fact, while some studies have found that the presence of red light cameras can increase the risk of intersection car accidents by up to 28 percent, others have pinpointed this increased risk to be as much as 70 percent. For some final important facts about intersection car accidents, be sure to check out the upcoming conclusion to this blog. Since 1983, the Littleton car accident attorneys at Bahr and Kreidle have been fighting on behalf of injured people and aggressively standing up against injustice, inequality and intolerance. Our lawyers know how serious and devastating the impacts of intersection car accidents can be, and we know that many injured people depend on settlements to get the medical treatments they need. That’s why we are committed to being here to advocate injured people’s rights, help them hold negligent parties responsible and ultimately get them the highest possible awards for their injuries and losses. If you or a loved one has been injured in a car accident, our Littleton car accident lawyers urge you to get more information about your potential case and rights by meeting with us for a free, no obligations initial consultation. To set up a meeting, call us at (303) 794-7422 or email us using the form on this page.